A gentle, sweetly illustrated concept book takes on physical forces as young children learn about pushing and pulling. It’s time for Bird to build her nest! Follow her as she pulls a worm out of the ground, lifts some twigs that are just the right size, and pushes the twigs into place. Uh-oh! One of the twigs falls to the ground! But after a day of hard work, Bird’s nest is ready and waiting. Can you guess what it’s waiting for? Using simple, clear language and beautiful illustrations, this engaging story is the perfect introduction to physical forces for very young readers. A final spread with some simple questions promotes discussion with parents, teachers, or caregivers and encourages readers to think about the concepts introduced. Martin Jenkins has written many celebrated books for children, including The Emperor’s Egg, illustrated by Jane Chapman, and Can We Save the Tiger?, illustrated by Vicky White. Martin Jenkins lives in England, where he also works as a conservation biologist. Richard Jones is an illustrator with more than fifteen years’ experience in the creative arts. He lives in England. Bird Builds a Nest: A First Science Storybook works well as a straightforward narrative that concludes with the toddler-pleasing sight of a nest full of ready-to-hatch eggs...It's become de rigueur to introduce little kids to science concepts, and Bird Builds a Nest is among those with standout illustrations. In fact, Richard Jones's nimble mixed-media compositions, which have the look of cut-paper tableaux, are downright suitable for framing. 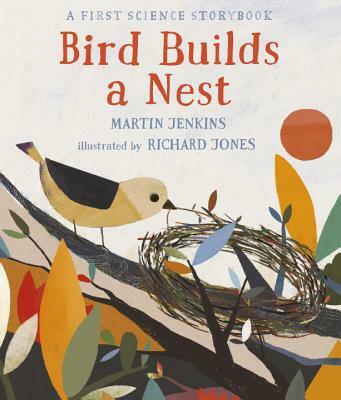 This simple book about a bird’s nest-building activities is accessible as both a story and a book about science....This new series launch serves as a gentle introduction to scientific principles for the very young. A solid read-aloud for young nature lovers. A worthy...venture into multidisciplinary teaching for very young children. In an expectant tone and encouraging curiosity, Jenkins’ text playfully captures the bird’s lengthy task of building a home, with an emphasis on the bird’s physical actions, like pushing, pulling, and carrying. Jones’ mixed-media illustrations, rendered in muted natural tones, nicely underscore the concepts, especially as the nest gets gradually bigger...Inquisitive little ones will appreciate this approachable STEM- friendly read. Jones’ illustrations make this a visual pleasure, with a stylized bird in designer earthtones reminiscent of Charley Harper; a petite seven-entry index is included to help listeners “look up the pages to find out about forces.” This is an attractive, engaging debut for a promising new series. In this kickoff to the First Science Storybook series, author and biologist Jenkins follows a bird as it builds its nest...Closing questions invite readers to revisit the book with the concepts of pushing and pulling in mind: “Can you find some places in the book where Bird pushes something?” It’s a neat way for readers to see science fundamentals at work in nature.